CB Richard Ellis (CBRE), the global leader in commercial real estate services, manages more than 1.7 billion square feet of buildings around the world. It also has to comply with federal and local rules for ballast, battery, and lamp recycling. The California-based company used to rely on a tangled network of waste management suppliers that made it difficult to standardize and replicate services in various locales. Mark Aaron Polhemus, director of engineering for CBRE's Washington, D.C. market, remembers those days. "It was a lot more difficult. You were never sure you were up to speed with all EPA standards. And we were looking through the Yellow Pages to find services," he said. Polhemus, who oversees engineering staff and operations for 400 locations, can now procure services for existing and new assets and access a summary of universal waste recycling results as well as research advances and new programs that might interest his clients -- all through the Air Cycle Corp. Web site. CBRE recently announced plans to become carbon neutral in its own operations – with a target to achieve this goal by 2010. At the properties it is managing for clients, CBRE has made a long-term commitment to an environmental sustainability program known as Sensible Sustainability™. When Polhemus joined CBRE his initial assignment was to find better methods for recycling fluorescent bulbs and other waste for all the company's assets. He had used Air Cycle Corporation's help when the company was owned by Trammell Crow and turned to them again. Air Cycle has a number of programs, such as the EasyPak ™ Pre-Paid Recycling Program, that allows companies to ship spent fluorescent lamps and batteries to recycling facilities in U.N.-approved containers. 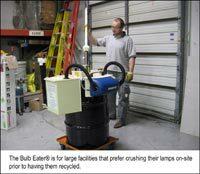 It also invented the Bulb Eater® for large facilities that prefer crushing their lamps on-site prior to having them recycled. Polhemus quickly embraced Air Cycle's various programs and found success. But the size of the CBRE portfolio, which includes about 4,500 properties in the U.S., presented a whole new logistical hurdle. Even though CBRE assets were mostly office buildings, each would require a different combination of recycling services. And each would benefit from a direct conduit to updated recycling information and guidelines for various types of wastes. A customized, dedicated Web-based program seems to fit the bill. "We have a huge variety of different tenants and customers. This program allows our real estate managers to have at their fingertips the local laws to make sure tenants properly dispose of hazardous waste and keep mercury out of our nation's landfills," Polhemus said. "It costs a little bit. But we assume as environmental sensitivity continues to grow, you would see the cost stabilize as this becomes mainstream. It's just like any new product." The innovative program that began with just 50 properties, will eventually serve the 4,500 properties that CBRE manages in the United States.